The mountain rail journeys in India are so diverse and panoramic that they never cease to enchant authors, filmmakers, photographers, explorers and travelers. With 17,000 trains of different sizes carrying more than 18 million passengers across the 64,000 km long track, the Indian Railways has many tales to tell. After a flight to India, do travel by trains which run through the remote interiors, forested areas, coastal regions, steep plateaus and precarious mountain terrains of the country. Train travel along the zigzag railway routes through the mountains of India is an exploration drive high on euphoria just like an escape to John Keats’ melodious world of nightingales. Indian Eagle shares tidbits of the best trains for mountain rail journeys in India. One of the most picturesque and highest railway tracks in the Himalayan region of India, the Kalka Shimla Railway is a wonder of technology. Built in 1903, the 96-km long rail route is a steep climb across the hills. The train Himalayan Queen crosses 900 curves, 102 tunnels and 87 bridges on the route. 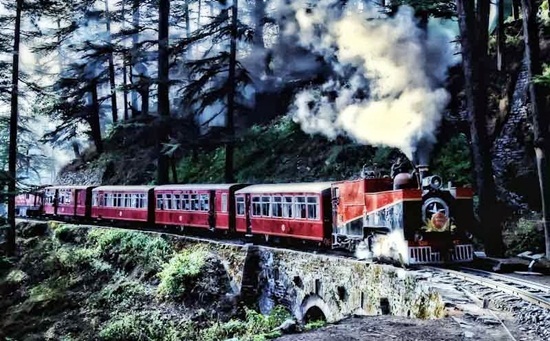 Listed in the Guinness Book of World Records, the Kalka Shimla Railway used to transport the English ladies to Shimla, the then summer capital of British India. The wonderful artifices of nature on both sides of the track make this train travel a euphoric experience. The train runs from the Shivalik foothills at Kalka, a town in Panchkula district of Haryana to Shimla at an altitude of 2,076 meters in Himachal Pradesh. 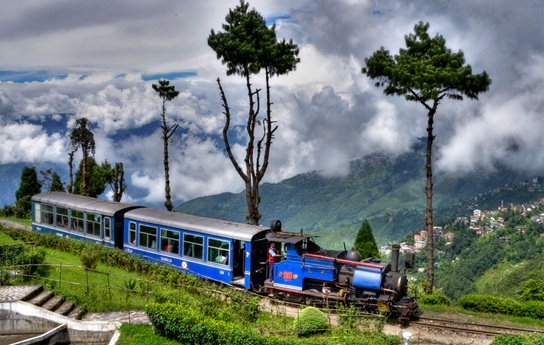 Darjeeling is a paradise on earth, and the Toy Train is the gateway to this paradise in the Himalayas. The Darjeeling Himalayan Railway, popularly known as the Toy Train for its miniature size, is the first passenger route in the mountainous terrains of India. A World Heritage Site, the Toy Train was built in 1881 to boost the development of Darjeeling as a tourist destination in the Himalayas. The 88.48 km gauge track from New Jalpaiguri to Darjeeling passes through several green valleys and 11 hill stations. Ghoom, the second highest railway station in the world, is a halt on the way. The journey begins with an eyeful of green valleys and ends with a panorama of the Kanchenjunga. The 11 km long part of the track from Sukna to Rongtong consists of dense forests. The way up to Kurseong is a sprawling hilly area with tea gardens. The 30 km of the route up to Darjeeling is the alpine landscape dotted with Himalayan pine trees. The Nilgiri Mountain Railway in Tamil Nadu is the most scenic route penetrating the mysteries of nature. The beauty of this South Indian railway is aesthetically captured in the “Chaiya Chaiya” song in Mani Ratnam’s Bollywood blockbuster Dil Se starring Shahrukh Khan. Built in 1908, the 46-km long single track railway across an elevation from 326 m to 2,203 m is a marvelous work of engineering. One of the best trains for mountain rail journeys in India, the Nilgiri Passenger passes through 16 tunnels, 250 bridges and 208 curves during its uphill journey from Mettupalayiyam to Udagamandalam or Ooty at the peak of the Nilgiri Mountain. The route consists of tropical forests with eucalyptus and acacia trees. We offer the lowest airfare to India just as these mountain railways provide pleasant travel experience. Online booking of the cheapest flight is just a few clicks away from IndianEagle.com. Just beautiful pics, post and Blog. Keep it up. I would like to travel to Simla, Dargeeling & Chirapunji coming June – July 2015. Is there any tour package able to cater for 4 – 6 paxs. Nice to hear from you! For your information, we don’t sell tour packages. We book the cheapest flights for travel between USA and India. For flight booking, you can log on to http://www.IndianEagle.com or call our travel experts at 1800-615-3969 at any time. These travelling places looks great. I will definitely visit these places by the end of this year. If any one have tourist packages, please share to my email id.